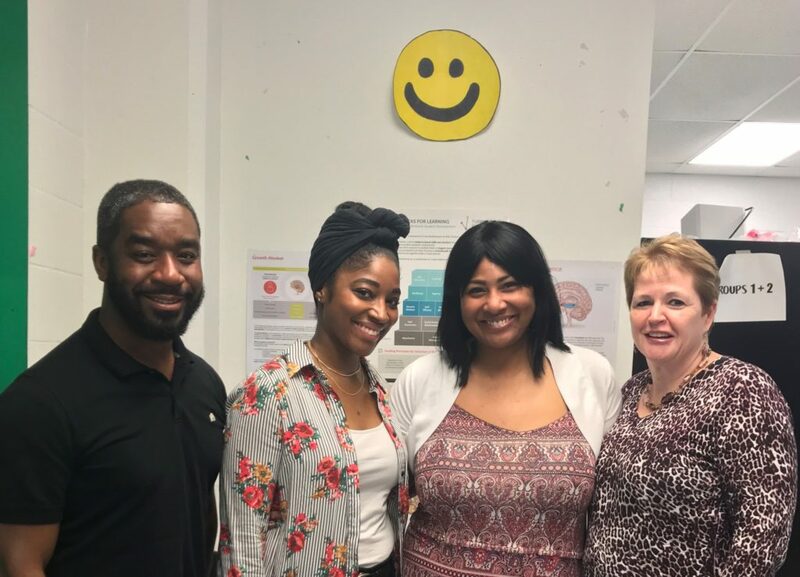 Pictured left to right: Matthew Vialva, Social Work Consultant; Joscelyn Reed, Instructional Coach; Erica Samuels, fourth-grade math and science teacher; and Dawn Foreman, Program Director. Erica Samuels is a fourth-grade math and science teacher at Malcolm X Elementary School, one of Turnaround for Children’s partners in Washington, D.C. Ms. Samuels was nominated by Program Director Dawn Foreman for the work she puts into building a growth mindset and relationships with her students. She reminds her students that “sometimes tasks will be hard, but with continued practice and effort, things will become easier.” Ms. Samuels holds high expectations for her students and creates the conditions necessary for students to rise to those expectations. ERICA SAMUELS: I always knew I wanted to work in education. To give you a little background, my mother had a home daycare center, ever since I was born. So, I’ve always been around children. I would get off the school bus, get my snack and go straight to the daycare [to help out]. I developed a passion for teaching, even at an early age. THE 180: What has your teaching career looked like? ERICA SAMUELS: This is my fifth year here with Malcolm X Elementary School. I started with elementary school, and then I moved to an alternative middle school – students that were kicked out of their neighborhood school and were trying to get on the right path – for a few years. I realized that even though I was really good at teaching middle school, a lot of my students needed a good elementary foundation, and they didn’t have that. One of the reasons I decided to move back to elementary was to help provide students with that strong foundation. THE 180: Dawn mentioned you do a lot with growth mindset in your classroom. What does that look like? ERICA SAMUELS: I don’t even know where to start! Even today, we’re talking about the difference between effort and intelligence. And just making sure that everyone has a growth mindset to drive their motivation. I share things about my life with them. I even showed them my middle school report card – and it wasn’t the best – but because of this, I became real to them. I want my kids coming to school with a positive attitude, and I want them to see that in me as well. THE 180: And it seems like you also do a lot of relationship-building with your students. Why do you think that’s so critical to learning? ERICA SAMUELS: I tell all the teachers this – especially the new teachers. I don’t care how many books you know, how many curricula you know, if you don’t have a relationship with the students, they’re going to lose. And in my classroom, the foundation that we have is we are all family. I’m not your friend, I am your family member, and what that means is you don’t want to disrespect or hurt your family member. I get into my kids’ business, like, “What did you all eat last night for dinner?” My students can tell you just about everything – not everything – but a lot about me. They know my parents, my sister, my favorite food and color – because they know me, and I’m real to them. I think relationship-building is critical to being a great teacher. THE 180: What changes have you seen since Turnaround started partnering with Malcolm X? What really excites you about the partnership? ERICA SAMUELS: I love the people that work with Turnaround for Children. They always have a great vibe about them. I guess it’s their experience. And I know that they’re here for us. I don’t feel judged when they come in my classroom. I feel like they are really here to help me and help my students and help my colleagues. And I think that’s the biggest thing, because, you know, it’s easy when someone tells you something, but when you know that that person is serious and really cares about you growing, that means a lot. And I’m pretty sure just about everyone on the staff would say that, yes — everybody on the Turnaround team really cares about them. ERICA SAMUELS: I think my thinking has changed a lot with Turnaround. I don’t even want to tell my kids, “Oh, wow, you’re so smart!” I had to change that. I’m like, “You know what? I love the effort that you put forth.” Even something as simple as that, it has really made a huge difference. ERICA SAMUELS: That’s a great question. I feel like I’m Miss USA. [LAUGHTER] They need structure. I think that is one of the biggest things that kids actually yearn for. When teachers don’t have structure, especially within their classroom, it becomes chaotic. And things don’t go right. But when you have structure, I feel like that is a necessity to be productive. THE 180: Is there anything else that you would like to add? ERICA SAMUELS: I just really appreciate Turnaround a lot. They help us look at things a little differently in order for us to be productive at the school. And I’m very grateful for them for that.